This Research Note describes the varied history of the Henhurst manor and its lords over a thousand year period. It draws upon a variety of primary and secondary sources though it can say nothing of the actual buildings of the manor as nothing has yet been found. An examination of the standing building at Jeskyns Court follows this note. Henhurst was a Saxon estate, perhaps older than the Cobham estate which became the manor of Cobham Hall. Its name occurs as Hennhyrste in a document of the early 11th century when it was one of the estates of the King which contributed to the upkeep of Rochester Bridge1. Previous assessments of a date of c.975 AD are now thought to be incorrect. Before 1066, Hanehest was valued at 20s and it was held by one Godwin, whose overlord was the Earl Godwin of Wessex2. 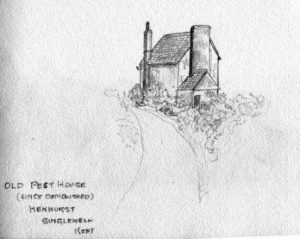 Margaret Gelling writes that the place-name meant a wooded hill where there were birds3 (but not necessarily an enclosed wood as Nicola Bannister suggests). The Henhurst lands lay around Winstead Hill (Winscot H in 1840, Wincett H in 1770), a spur of gently rising ground which runs NE from the present Cobham village. The manor house, Hennerst or Hennarst Courte, was still standing in 1572. The Tithe Map of 1840 (above) shows a small house with outbuildings, around a pond at parcel 312, within a square loop in the lane west of Court Wood [east being at the top of the map]. The loop existed until 1903 but had gone by 1920. The house and buildings were slightly sheltered in a hollow on the SW facing hill slope. However even if this house was medieval, it was too small to be more than a fragment of Henhurst Court. By 1086, the year of the Domesday Survey, Hanehest was one of many manors acquired legally or otherwise, by Bishop Odo of Bayeaux, William the Conqueror’s half-brother. Ansgot of Rochester was Odo’s tenant there2 and it accounted for a ½ sulung (perhaps 100 acres). When Ansgot had acquired the estate it was worth 30s and now 40s. There was land for 1 plough, which was on his demesne land. There were 2 villagers and 4 slaves. But two years later Odo was forced to surrender the manor. Henneherste was again assessed at a ½ sulung in 1100 in the Domesday Monachorum survey and Ansgot of Rochester still held it, but now of the Archbishop of Canterbury. Ansgot also held Maplescombe, Hoo, Beckenham, Aldington, Stockbury, Great Delce and Stoke4. In a charter, probably of 1108, Gotcelin de Haenherste held the manor5 and was one of many who donated the tithes of their manors to the monks of St Andrew’s Priory, Rochester for the use of the poor. The donations were confirmed in later years by successive archbishops. Hasted says that Gotcelin later became a monk at St Andrew’s Priory6. We hear of no successor and the manor may even have been abandoned for a time. After Gotcelin’s death Henhurst must have reverted to the Crown, as in 1169 Henry II granted it to William de Lanvelei7, one of that king’s administrators in Brittany who came to England with him in 1171 or 11728. The Lanvelei family continued at Henhurst for 3 generations. It was probably the favourite manor of the first of them, for he styled himself William de Lanvelei of Henhurst. No doubt he built himself a substantial house here, though no trace of it remains above ground. The first William de Lanvelei died c.1181. The last payment to the Exchequer of quit rent for his Henhurst lands appears in the Pipe Roll of 1189 – the first year of Richard I9. William’s son William II de Lanvelei inherited Henhurst and closer to his own desires, governed Colchester Castle, until he died in 120410. He was succeeded by his son William III de Lanvelei, who was on King John’s expedition to Poitou in 1214. Then he changed his allegiance to support the rebel barons and he was one of the council of Twenty Five who witnessed and were sureties for Magna Carta in 1215. William III died possessed of Henhurst in 121711. His infant daughter Hawise became the ward of Hubert de Burgh, justiciar for England and she was in his custody in 1219. Her manors of Chauk’ and Henneherst were now valued at £40 per annum12. There follows a gap of 70 years or more in the documentary record until Hasted notes from an Escheat Roll (IPM) of 1287 that Edmund I, son of William de Pakenham had died possessed of the manor13. However this does not fit with the known ancestry of the Pakenhams and Hasted’s Edmund I may in fact be the same man as Edmund II below. Hasted further asserts that Henhurst was then given to the Priory of Leeds which held it until the dissolution. This idea, and the later descent of Henhurst to George Brooke Lord Cobham, seem to derive from Thomas Philipott. A A Arnold and more recently Nicola Bannister14 follow Hasted. Dr Bannister also cites Sherwood’s transcript of the Cartulary of Leeds Priory15 in support of this. However, given the evidence below of Henhurst’s ownership by the Pakenham family and others up to the reign of Elizabeth, its gift to Leeds seems very unlikely, particularly as neither Sherwood’s Cartulary nor Dugdale’s Monasticon16 mentions Henhurst or Cobham at all in connection with Leeds. Possibly all that was given to Leeds was a portion of the tithes of Henhurst, which we know was transferred by a grant of 1541 to the Dean and Chapter of Rochester cathedral 32. It is true that the Pakenhams had acquired Henhurst by the early 14th century or earlier. In 1305 William son of Sir John de Pakenham exchanged lands in Norfolk and Suffolk and the manor of Henhurst in Kent, all of which had belonged to Sir John, with his uncle Sir William de Pakenham of Surrey for lands in Pakenham and elsewhere. William’s son John de Pakenham released his interests in these manors to Sir William de Pakenham of Surrey’s son Edmund II, at the same time 17. By 1332 Sir Edmund II son of Sir William had died posssessed of “a messuage called Henherst” held by service of 1/40th part of a knight’s fee from Robert de Ufford who was soon to become Earl of Suffolk. The value of the manor was 3s4d pa and it included 120 ac of land, 3 ac of meadow, 80 ac of pasture, 3 ac of woodland & 33s per annum rents. Edmund de Pakenham III his son, aged 30 years was his next heir18 and had livery of Henhurst and other lands in 1333. He died in March 1350-51. By 1352 Rose, widow of Edmund II de Pakenham had died. Her dower included 1/3rd part of the manor of Henherst, now held of Ralph Earl of Stafford as of his castle of Tonebregge, by a 1/40th part of a knight’s fee19. The remaining 2/3rds part of Henhurst had already passed to her grandson Sir Thomas de Pakenham in 1351. However in 1353 this Sir Thomas made a grant of all the lands he had received from his father and from his grandmother Rose, to his mother Mary de Pakenham. Thus Mary now held the whole of the manor of Henhurst20. Sir Thomas died in 1357. In June and July 1358, his mother Mary, widow of Sir Edmund III de Pakenham (who had died 7 years previously) enrolled two deeds on the Close Roll. Firstly a suspended grant of rent of £20 per annum from her manor of Ditton Valoyns, Cambridgeshire, to Sir William Vaghan and his son Sir Thomas. Mary’s deed was dated at Henherst suggesting that she still occupied the manor house. Secondly an indenture dated at Bury St Edmunds jointly with the Vaghans, to guarantee her recent conveyance to them of Henhurst Manor, against claims by her son’s heirs. While there was no claim, the £20 grant to them would have no force21. Mary de Pakenham died in 1362 22. Sir William Vaghan died in the late 1350s. When his son Sir Thomas Vaghan died in 1361, he held the manor of Henhurst by Shchyngeldwell from the Earl of Stafford, as of his manor Tonebregg, but now by service of 1/8th part of a knight’s fee; and he left an infant son Hamo 23. Hamo Vaghan would have inherited Henhurst and any other property of his father when he came of age about 1381 but his inquisition post mortem of 139424 explains that “long before his death” he had granted his Essex and Northamptonshire manors to Roger Bokilton and 2 others. The inquisition mentions no Kent properties, so Henhurst had probably already been granted elsewhere. The documents show a complex series of exchanges around the turn of the century 22,27,30. At Henhurst, Hamo’s mother Alesia Vaghan widow of Sir Thomas, presumably received 1/3rd of the manor as her dower, 11 years before she married one John Burton in 1372. Alesia outlived her son, so that only 2/3rds of the manor could ever have gone to Hamo in his lifetime. Some years before 1420, Roger Bokilton had somehow acquired half of the manor, as his three children Philip, Margaret and Katharine each inherited 1/6th of the manor ie 1/3rd of half of it. An inquisition post mortem of November 1420 25 found that Margaret, who was widow of Sir Richard Mytton, had died in August 1420 and left 1/6 of the manor to her son William aged 8. Another inquisition of the same date 26 found that Philip Bokilton had died in September 1420 and left 1/6 of the manor to his sister Katharine, aged 49 (who had married John Falke of Hereford). Katharine must already have had the other 1/6th. The manor was held of Humphrey, son and heir of Edmund formerly Earl of Stafford, who was then a minor. John Harpur of Ruysshale, Essex first appears holding the wardship of part of Henhurst in 1419-22. He and his wife Eleanor acquired the manors of West Tilbury in Essex, Pomfret in Middlesex and the whole of Henhurst in Kent in 1437. VCH notes that the flooding of much of the Isle of Dogs in 1448 was attributed to neglect of the river walls on the SW side by the freeholder, presumably as it fell in the manor of Pomfret in Stepney, which John Harpur then held 27. In 1488, William Harpur, who may have been the son of John and Eleanor, let the manor of Henhurst to Richard Joskyn, a tailor of London but lately from Henhurst, for a 10 year term at an annual rent of £8. All apparently went well until the end of the ten year term, when Harpur claimed that Joskyn owed him £6 arrears of rent for 1497 and £8 for a further year, 1498. Joskyn claimed that he did not owe it. The case was heard in the court of common pleas in London in 1500 and we hear no more, so it was presumably settled 31. From about this time onward, while the manor of Henhurst continued to exist and its lands continued to be farmed by tenants, the manorial buildings themselves were probably in decline. What did those manorial buildings amount to? In England as in Normandy in the late 12th century when the Lanvelei family were granted the manor, the usual arrangement would be a first floor chamber building (with storage beneath) for the lord, probably of flint and stone, and a ground floor aisled hall of timber for his supporters. There would be a detached kitchen close by and barns and other buildings, all within an enclosure 38. During the 13th century, the manor should have been flourishing, but we actually know little about it until the advent of the Pakenhams. The widowed Lady Mary de Pakenham may still have occupied manorial buildings of this sort in 1358. A decline in their status probably ensued when it was inherited by a minor in 1362 and its ownership then fragmented for 75 years. Given that the Harpurs were some distance away in Essex and that one of them neglected his Stepney property, Henhurst may have been in a poor state by the time John Harpur let it to Richard Joskyn in 1488. There is a suggestion from a rental that Hennerst Court was still standing and recognisable in 1572 39 but after that we really do not know what happened to it. Without more evidence, particularly from excavation, we do not know whether Richard Joskyn occupied the old Henhurst manor house in 1488 or whether he now set about building the structure which forms the core of the present house named Jeskins or Jeskyns Court. The house is recorded as 16th century in the Kent Historic Environment Record, despite its 18th century brick frontage. The family, known variously as Joskyn, Geskyn or Jeskin, had been active in the Cobham area for well over a century, Walter son of Walter buying land in 1335 33, John witnessing deeds in 1336 34, Walter lending money in 1355 35 and having an official duty for the new Cobham College in 1369 36. Richard the elder, husbondman, perhaps the father of the tenant above, received a pardon in 1450 for taking part in Jack Cade’s rebellion, as did John Joskyn, yoman and seven others in Cobham parish 37. John Joskyn held 7 acres at Toltyngtrowgh in 1460 38a. The last mention of the Joskyn family in Cobham (and in Kent) was in a court case of 1533-1538 when John and Agnes, the children and heirs of Richard Joskyn were selling gavelkind lands in Cobham, to George son of William Wright and Nicholas (or Thomas?) Harper, who had married William’s widow41. The significance of this transaction is unclear. It should be noted that Edward Hasted’s account discussed above, although it assigns Henhurst to the Priory of Leeds from the later 13th century up to the dissolution, does eventually bring the manor back to the Harpur family, to a line of possession that we have traced back to 1305 by a different route. Thus Mr Hasted and I agree that by 1547, Henhurst manor was owned by Sir George Harpur of Sutton Valence, who was then sheriff of Kent. The remainder of this account follows Hasted, except where references or descriptions indicate otherwise. Sir George’s son, another George Harpur, joined Sir Thomas Wyatt’s ill-fated rebellion in 1554 and was committed to the Tower, but he was released by Queen Mary’s “especial grace” next year and pardoned. The main interests of the Harpur family were in Sutton Valence and they may have visited Cobham only infrequently. Early in Queen Elizabeth’s reign George Harpur’s son Sir Edward sold Henhurst manor to Thomas Wright. The Wrights held the manor for 80 years, but they were not without their difficulties. Thomas’s son George had no descendants and he left the manor to his kinsman Sir George Wright. Afterwards, when Thomas Wright the son of Sir George, possessed Henhurst manor, he was for reasons unknown, proclaimed an outlaw. Probably to prevent its forfeiture, he sold it in March 1638 to Queen Henrietta Maria’s Physician, Dr Maurice Aubert or Obert 42. Perhaps the outlawry was related to the imminence of the Civil War; however after a few years Aubert sold the manor on to Henry Gifford esq of Burstall, Leicestershire. The Giffords, being Leicestershire people, may not have taken much interest in Henhurst, especially when Henry Gifford was created a baronet in 1660. He left the manor to his son Sir John Gifford in April 1665. Sir John died in 1707 and left the manor to his son of the same name, who died without issue in 1736. His sister and heir Mary Anne Gifford inherited his lands in Kent and other counties 43 and she sold Henhurst manor to John Staples Esq of the Temple, London in 1750. John Staples’ interests seem to have been in East Grinstead, Sussex and of course in the legal world in London. In his time, a lease of the Manor of Henhurst of 1788 described “all that messuage, tenement or farm known by the name of Giskins or Henhurst Hall” 40. If this tells us anything, it is that Jeskyns Court had now taken over as the focus of the Henhurst estate, as far as its tenant farmers were concerned. John Staples died unmarried and his will, proved in 1789, left Henhurst manor and all his houses and lands in Cobham, together with the half of the tithes of Henhurst which he had leased from the Dean & Chapter of Rochester, to Percival Hart Dyke, 2nd son of Sir John Dixon Dyke Bart. of Lullingstone Castle and Lady Dyke, who was his relative 44. Sir Percival Hart Dyke, who was owner in Hasted’s time, owned a great number of properties, especially in Kent. His lengthy will, written in 1845 and proved in September 1846, demised so many properties that Henhurst was not mentioned by name, but was included in “All and every other my manors, messuages or tenements” in the county of Kent which he left to trustees to the use of his eldest son Percival Hart Dyke 45. Mr Arnold tells us that manor was the property of T C Colyer-Fergusson Esq of Wombwell Hall in his time, 1905. It is not clear when the ownership of Henhurst manor had been separated from ownership of Jeskyns Court, but 1845 seems a possible year. He also says that T H Baker of Owlets had told him that “he and his family before him had owned Jeskyns for many years”. The Tithe schedule of 1845 lists land parcels under the heading of “Henhurst Hard”(?) which include the “house, buildings, yard, garden and pond called Jeskins Court”. Thomas Baker was then the owner and William Pemble Wells the occupier. The “local” copy of the Tithe Map in Medway Archives, which is dated 1840, shows what must be the manor of Henhurst outlined in pink. Nichola Bannister, evidently working from the National Archives copy, which does not have this marking, nevertheless found a useful description of the bounds in 1728: “bounded by the lane from Dabs Place to ye house of ye said Mr Hayes towards ye south to a lane leading from Mr Hayes said house to St Thomas’ Well towards ye east, to a lane leadingfrom St Thomas’ Well towards Shingle Well north, and being co-extended with ye parish of Cobham boundeth on ye parishes of Ifield or Northfleet of both of ye said parishes towards ye west” 46. This description (except for the compass directions) agrees with the Tithe Map pink area, save that it does not include the area of Clay Lane Woods which lies north of the A2 trunk road. Much 17th and 18th century data on the lessees of the tithes of the manor and on the tenants of the manor survives and is listed in the Annex below. The farm continued on through the 20th century and at some stage the land was separated from the house of Jeskins Court. A Forestry Commission leaflet explains that “a former farm is now a large open-space recreational area with areas being developed as new wildlife habitats. The farm was put on the market in 2005, following the death of its owner.” Assistance from the Deputy Prime Minister’s Sustainable Communities Fund was given to the Commission to make this recreational development possible. Note 1: It should be borne in mind that another manor of Henhurst exists in Yalding parish in Twyford Hundred and there is a Henhurst Farm at Staplehurst, in Scray Hundred. There is also a Hundred of Henhurst in Sussex and the name occurs elsewhere in England. Note 2: This Note has particularly benefitted from Mr A A Arnold’s studies of the Cobham manors published in 1905 in Archaeologia Cantiana Vol XXVII, though I take issue with him as to any possession by Leeds Abbey. 5 Grant at Medway Archives ref: DRc_T057 (No.5) A copy of a lost charter of Bishop Gundulph dated 1091. This is a later inspeximus made in 1260 and recites the original text. Unfortunately internal evidence in the text is not compatible with the date 1091, though the year is clearly written. However the facts of Gundulph’s charter do seem to have been accepted in later centuries. The year 1108 was the only time when he and all the persons in the witness list were alive and in office, so AD1108 seems a reasonable date. Richard Hayes’ [published] diary of 1834 mentions Geskyns Farm was 356 acres. 49 Actual source unclear, but printed by AA Arnold, pp124-126 op cit above. Stevens, E J c.1935. Chapter Book of the Dean & Chapter of Rochester Cathedral. Extracts transcribed by Miss E J Stevens, who lived at Cobham Parsonage. Jeskyns Court lies at NGR TQ64976911, 1.2km west of Cobham parish church and 1.35km south of Watling Street. Jeskyns Road, to the south is at 83 m AOD.The house is aligned a few degrees west of south. To simplify this note, I have assumed that the Jeskyns Road frontage faces due south and the garden frontage towards Watling Street, the A2 road, faces north. From the road the house appears to be of early 18th century date. The clue that it is otherwise is the absence of an entrance in the long south frontage.The present house at Jeskyns Court consists of a central E-W range, parallel with Jeskyns Road, with a later cross-wing at the W end and a small, earlier cross-wing at the E end. The W cross-wing was not examined internally but its sash windows are recessed behind the window jambs. They are larger than those of the central range and have more slender glazing bars. The wing is constructed of red brick and is probably of late 18th century date. At the time of building it presumably included a west-facing front door. The roof of this wing is about ½ m higher than that of the central range and this can be seen from the S. The brickwork is in Flemish bond. The central range of the house is timber framed, though this is not visible externally as it has been encased in red brick in English bond. It seems likely that the W end of the central range which now abuts the W cross-wing, was originally an end wall with an exterior gable end, ie it was not hipped like the E end. This gable wall is impressively close-studded and the S wall may originally have been similar. An earlier, S-facing front door led to a cross-passage and a back door facing N, but both are now blocked. When the S wall was cased in brick, perhaps in the 16th century, an opening, with a brick relieving arch, was left for the front door. The sash windows of the central range are perhaps early 18th century, as their frames are flush with the front face of the wall. Internally, the central range of the house has a side purlin roof with collar timbers. Wind braces are visible in the roof plane above purlin level. These features suggest a late 15th century date for the original building of this range. The central chimney stack is not of an early date; the red brick fireplaces are substantial, but probably 19th century. In this case, perhaps the original chimney stack was external and was located at the back. The staircases are late, except for the newel posts of the attic stairs which could be late 16th century. There is a small brick structure of indeterminate date in a NE facing angle at the back. At the E end of the central range where it would once have abutted the early cross-wing (see below), is a pair of service doorways set between a ground cill and a ceiling girder. The doorways have 3-centred heads and plain spandrels set in the tops of their frames. On their W faces, ie away from the cross-wing, a cavetto outlines the shape of each doorway. A ½-round moulding frames the rectangle of each door frame and terminates in pyramid stops at the bottom. These doorways would have led to a buttery and pantry in the cross-wing and clearly comprise the E side of the cross passage through the house, the W side now being lost or concealed. The locations of the original exterior doorways to the N and S, now blocked, can be seen in the brickwork outside. The E cross-wing has the remnants of a collar purlin and crown post roof. A single plain embedded crown post survives behind the line of the back wall of the central range. One collar purlin sits on a tenon on the top of the post and extends N for about 2m in contact with two collars, but it is cut away S of the crown post. The post was braced upwards to the collar purlin (one now survives) and has mortices for braces (now missing) down to a tie beam. There are 3 or so remaining collars to the N but the rest of the roof structure is missing or cut away for a late chimney stack. Nothing remains at roof level to the S of the crown post. The crown post is seated on a substantial canted tie beam and a jowelled post is visible in the room below at the E end of the tie beam. A mortice in the jowl originally housed the tenon of a downward brace (now missing) to a horizontal timber below, but a rebate in the edge of the post appears to have been made for a door (also missing) which must have displaced the brace. It appears that the central range of the house was extended E across the end of the cross wing at first floor level. Various heavy ceiling timbers can be seen in the ground floor rooms and may have been part of the original cross-wing. Given that only one frame of the E cross-wing survives, a date at some time in the 14th century is the closest that can be suggested for it (and the phase of the house to which it related). The cross-wing was arguably of too high quality to have been a cottage but too narrow to have been a complete house in itself. So a wing was probably its original function. Three pottery sherds were found on a buried chalk surface 5 m to the E of the house. All were of a hard, fully reduced grey sandy fabric, probably dating between 1250 and 1400 AD. Despite the poor survival of parts of the building, it is clear that a house of 14th century date existed here and was largely rebuilt in the late 15th century. The house was refaced in brick, probably a century later and rewindowed in the early 18th century. A larger cross-wing was added at the end of that century and this, with minor changes, is what survives today. It is not really possible to say whether this house was the medieval manor of Henhurst Court. This entry was posted in Research and tagged Cobham Landscape Detectives, cobham village, social history. Bookmark the permalink. I hope it is appropriate to post this comment here. It is not strictly relevant to Henshurst itself and is purely an amateur observation. My understanding of the document is that Jane Sanders or Saunders lived there with her daughter Ann Stanley nee Pigott. Both Jane and Ann had died though I have no burial details for either. At one time Ann’s husband Thomas Stanley, who had pre-deceased both the women, also lived there. Their joint possessions relating to thier business and home had to be documented to provide support for Ann’s young children. Mother Jane nee Plummer was married firstly to Nicholas Pigott of Meopham, died 1701, and later to Edward Sanders of Cobham, died 1726. Nicholas and Edward are buried at Meopham in adjacent plots. Jane was the daughter of Thomas Plummer of Farningham. I am plodding slowly back on family history work and found your posting about the area of great help. Thank you so much for providing some additional material on the history of Henhurst. 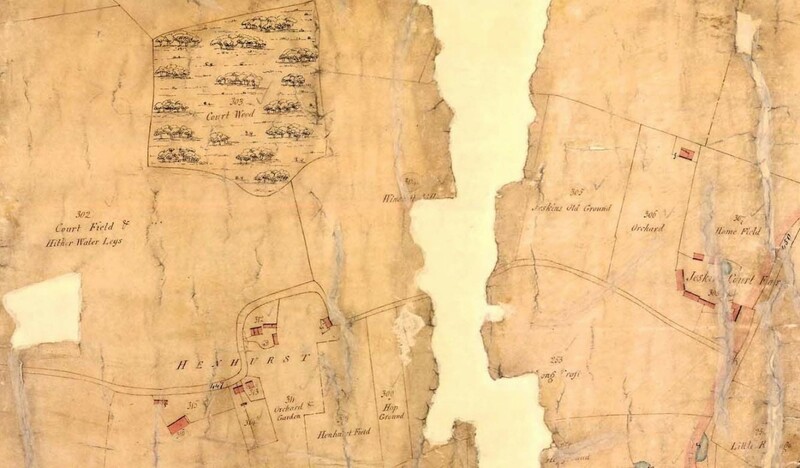 The intention behind the Research Note series on the 5 manors within Cobham parish was to produce a more accurate background to the history of each manor than was provided by the old 17th, 18th and 19th century historians. Much of what they wrote was reliable enough, but we have better access to the contemporary sources nowadays and researches over many years into manorial and building history have also increased the background knowledge available. We hope that the Landscape Detectives project will encourage future researchers and provide starting points for possible new lines of inquiry, so we are very glad to hear that you have found the website helpful. We hope to update each of the manorial histories from time to time as new material comes to light. Thank you for the wonderful and helpful information you are uncovering. I have spent several years researching the Harpur family, before and after Henhurst. I shall revert if I have any extra information or clarification to contribute. Have you seen this record from Kent Archaeological Society, 2012, Kent Feet of Fines – Philip & Mary: [c.1548] 2 Edward VI [NA (PRO): CP 25 (2) 59/439 (Easter Term), No. 65. Q: Ric Stace. D: Jn Harper, gent. Manor of Henhurst with 3 mess, 220a land, 40a wood, 40a waste in Cobham. Enfeoffment.